Star Clippers has recently announced plans for a 300-berth square-rigged ship that will be designed after one of the world’s two largest square-rigger, the France II. Now under construction at Brodosplit Shipyard in Croatia, she will join the fleet in 2017. Elsewhere, UK-based Riviera Travel is in the course of doubling its fleet of owned river ships to four, while Germany’s 550-berth Deutschland has now gone to US buyers Absolute Nevada, who will charter her to Semester at Sea as the World Odyssey. Fifteen years after its last newbuilding, Star Clippers has confirmed that it is building a fourth ship. The new vessel, to carry 300 passengers, will be delivered in the second half of 2017. The latest square rigger in the Star Clippers fleet is now under construction at the Brodosplit Shipyard in Split, Croatia, and will be the most ambitious project yet for the Monaco-based sailing specialist, whose owner Mikael Krafft has long wanted to recreate the France II, one of the two largest square-riggers ever built. The new ship’s rig will be identical to France II, at 68,350 square feet of sail, and dimensions will be very similar. France II measured 480 by 56 feet. Star Clippers’ last newbuilding, the 227-passenger Royal Clipper is a replica of Preussen, one of the most famous sailing ships of the early 20th Century. 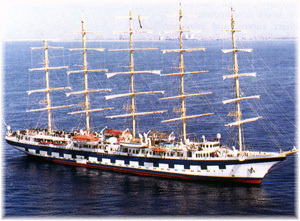 While Royal Clipper measures 440 by 54 feet, Preussen herself, at 482 by 54 feet, was a contender with France II for the title of largest square-rigger ever built. 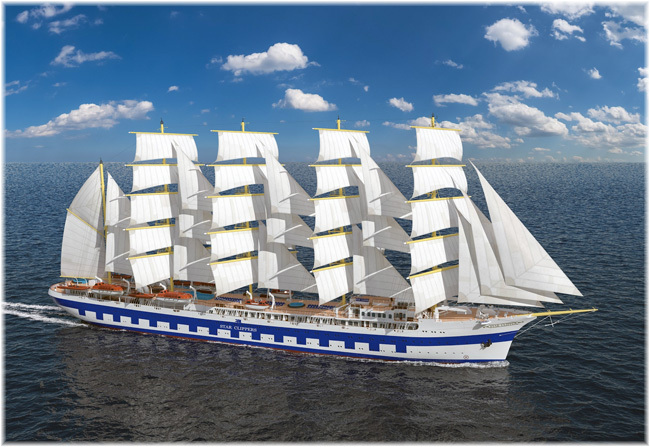 Carrying five masts, Star Clippers’ new ship will measure 8,770 tons. Under the masts will be found three swimming pools, one of which will allow sunlight into the dining room below, much like on Royal Clipper. Another pool on the aft deck will be for dive training and will descend twenty feet down through two decks, with glass sides. There will also be a water sports platform at the stern for use when the ship is at anchor. The new ship will feature a variety of cabin grades, including thirty-four suites with balconies, a first for Star Clippers, and four owner’s suites. A restaurant in the atrium will accommodate all passengers at open-sitting dining and other features will include an intimate library, the now-traditional bowsprit net where passengers can sunbathe high above the water, and the al fresco Tropical Bar for evening entertainment. At least initially, the new ship will sail Star Clippers’ most popular itineraries in the Mediterranean and the Caribbean. Compared to the large river operators from the US, Australia and the European Continent, Riviera Travel does not have a particularly high profile, but since we wrote about them in November its fleet has doubled to four ships. In business for over thirty years, Riviera first added river cruises to its portfolio just six years ago. All named after famous English authors, the Lord Byron and William Shakespeare have been joined this year by the Jane Austen, which entered service in January, and the Charles Dickens, to join the fleet next month. The company’s four 140-berth ships will now offer a range of twelve different European itineraries on the rivers Rhine, Danube, Moselle, Main and Rhone. Since acquiring its first ship in 2012, the company-owned fleet has also been supplemented by chartered vessels. Acquired by Phoenix Equity Partners late last year, Riviera Travel carried 15,000 river cruisers in 2013, but this number is due to increase as the company adds to its fleet. While flights are also offered, Riviera now provides convenient connections from fifty main railway stations in the UK, chief among them Glasgow, Newcastle, Leeds, Manchester, Liverpool, Birmingham, Nottingham, Bristol and Cardiff. Connections are then made by Eurostar services between London St Pancras Station and the Continent. 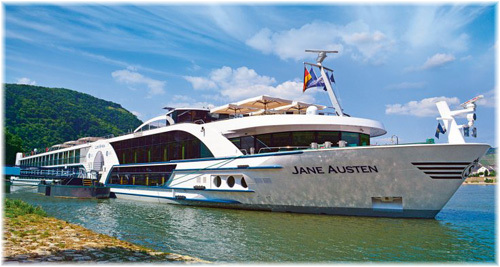 Riviera’s emphasis on a high level of cuisine and accommodations has earned them top ratings, with the first ship to be rated, the 148-berth Lord Byron (2012), achieving four-stars-plus in the first Berlitz Guide to River Cruising in Europe issued last year. 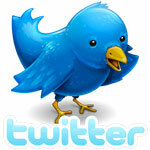 Fares start from as little as £999 per person for a week. 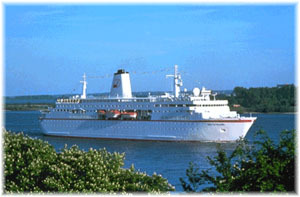 The 550-berth Deutschland has now been reported in the German financial press as having been sold to a US company called Absolute Nevada LLC. This Las Vegas-based firm also owns the 108-berth Americana, which last operated as Travel Dynamics International’s Yorktown. Other than United States Lines in the 1930s, not many shipping lines have been incorporated in Nevada, but we understand that Absolute Nevada’s major shareholder, Donald Hoffman, is located in Midland, Texas, and the company is also registered in Florida. The former Deutschland will now be chartered to Semester at Sea, replacing its own 832-berth Explorer, which it sold to Celestyal Cruises earlier this year, exiting the shipowning business. The Explorer is now operating as Celestyal Odyssey. Oddly, the Deutschland will adopt a similar name when she becomes the World Odyssey for Semester at Sea. Under her new name, she will depart Southampton on September 13 for a 100-day voyage taking in Civitavecchia, Naples, Istanbul, Piraeus, Valencia, Barcelona, Casablanca, Dakar, Salvador, Port of Spain, the Panama Canal, and a call at Puntarenas before arriving at San Diego on December 21. This will be followed on January 5 by a 101-day voyage from San Diego back to Southampton via Hawaii, the Far East and Africa, thus completing a circumnavigation of the world. Last week it was announced that Plantours & Partner would charter the Deutschland for four cruises between June 9 and July 29 as a replacement for its Hamburg, following her grounding off Tobermory in Scotland last month. The Hamburg has since left Belfast and is now under way to Lloyd Werft in Bremerhaven for further repairs. The Plantours crew is already on the Deutschland, which is now scheduled to arrive in Kiel from Gibraltar on June 9. 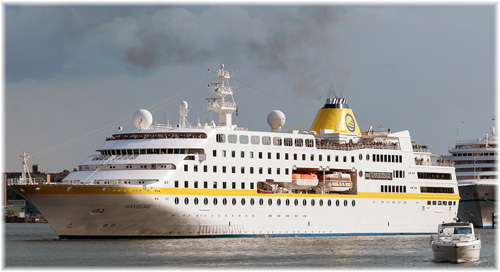 The Deutschland offers about 150 more berths than the Hamburg and as these will be Deutschland’s last cruises from Germany, it will be interesting to see if Plantours will be able to fill them with last-minute bookings.